The Cadillac Escalade was thoroughly redesigned for the 2007 model year. Offering the segment's most powerful V8, the Escalade features seating for up to nine. For 2008, the Escalade ESV comes with rear-wheel-drive, while all-wheel-drive remains an option. 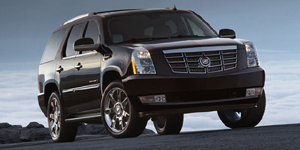 Find the used Cadillac Escalade of your choice from a dealer in your area. Search our used car listings now.